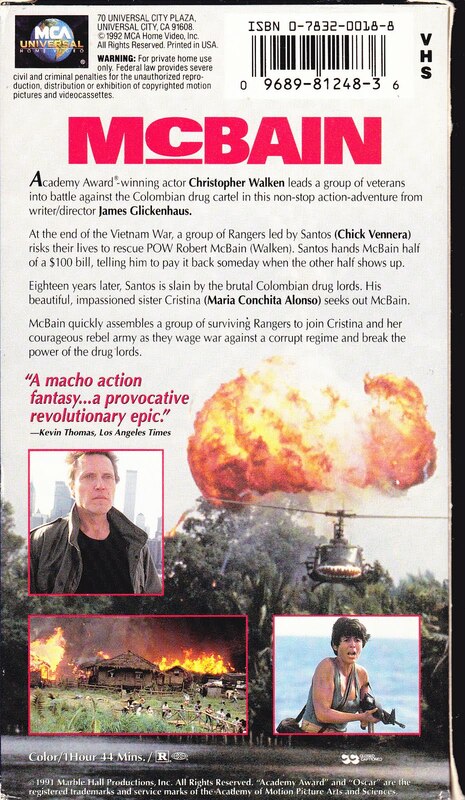 Back in ‘Nam, Santos (Vennera) rescued McBain (Walken) when he was captured and made a prisoner. A bond developed between the two men, as represented by a ripped hundred dollar bill. In the present, Santos is leading a revolutionary army in Colombia against the dictator oppressing their country. When Santos dies in that fight, his sister Christina (Alonso) goes to New York to find McBain. McBain then agrees to help Christina finish what Santos started, and rally the revolutionary rebels to victory. To do this, he re-assembles his team of old ‘Nam buddies, including Eastland (James), Dalton (Patterson) and Frank (Ironside), among other helpers. Will McBain’s team - and the people of Colombia - be victorious? Thanks to its cast and its professional sheen, McBain was one of the more well-known action titles around video stores back in the golden age. While it may not have had the visibility of a Van Damme, Seagal, Stallone or Schwarzenegger vehicle, it did have Christopher Walken instead, which is interesting - you don’t see him in roles like this too often. The only other one that comes to mind is The Dogs of War (1980). Walken’s square hair and Steve James wearing his trademark Wrestlemania hat brandishing a rocket launcher is a great combination. At its heart, this is just another exploding hut/falling guard tower movie, it’s just glossier. Imagine your standard “El Presidente” movie (for an explanation of this, see our review for Hour of the Assassin, 1987) crossed with the camaraderie of Last of the Finest (1990). 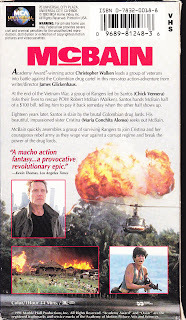 The film tries to be all things to all people, throwing a lot at the viewer: A Vietnam movie, an urban thriller, an airplane slog, A Mercenary action movie, and the aforementioned El Presidente and Exploding Hut scenarios are thrown in too, and the movie, trying to accommodate all these things, is overlong. Alonso is there to provide the societal comment and relevance to supposedly justify all the action, and Steve James proves he’s one of the most under-appreciated and awesomely cool stars of the era. And who wouldn’t want to do what McBain’s team does - get the old gang back together to bust some heads? This A-Team-inspired scenario is appealing, but there’s way too much fat around this steak. The middle section, where the gang is in New York City taking down the baddies, is excellent. The whole movie should have been THAT. But there’s all this other stuff, like an interminable tangent about airplanes and bogeys and such. In our eyes, even though McBain is of a higher quality and budget than a lot of the stuff out there, that ends up being irrelevant because the movie doesn’t live up to its potential. That New York City section, rather than just being a color on the action movie palette listed earlier, should have been expanded and brought to its full flower. While the movie is called McBain (not to be confused with Frank “Bulletproof” McBain or the Simpsons character), it’s really not ABOUT Christopher Walken’s character per se. We don’t know that much about him, and the movie doesn’t really revolve around him. It’s more about his team and the Colombian rebels scenario. While there are some cool aspects to this movie, we can’t wholeheartedly recommend it, which is a shame, because we’d like to. But the NYC portion of the film and the presence of Steve James, while they can’t support the whole thing, are bright spots in this mixed bag of a movie. 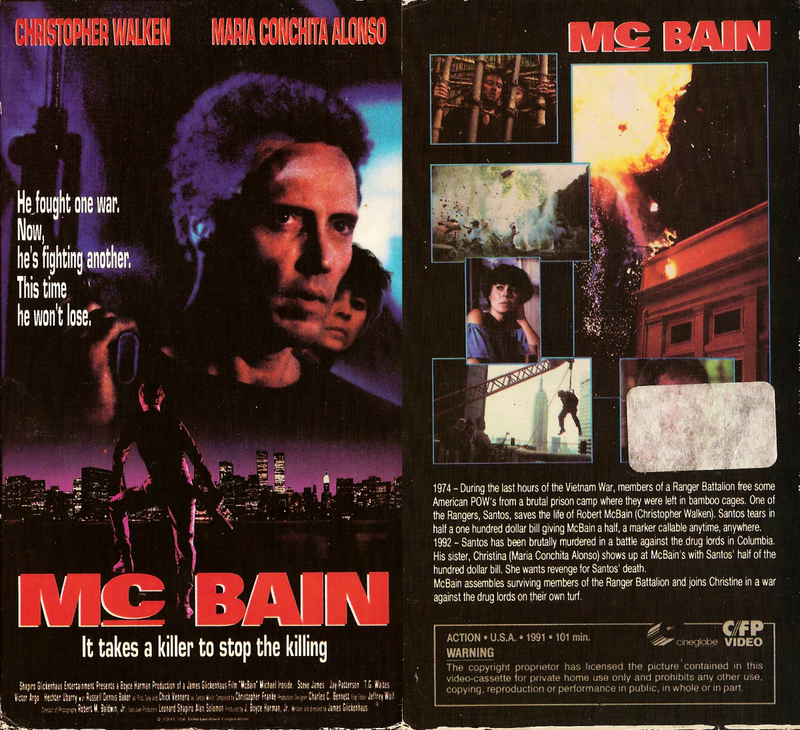 Also check out our buddy, The Direct To Video Connoisseur's review of McBain! I vaguely remember seeing this way back, and was mostly just surprised to see Walken in what looked like an action flick. Something you don't see often. Great review man! Thanks! We wished it was better though. Chris Walken should make more action movies! Great review Ty, I haven't seen this for along time but I remember liking this a little more than you do. It could be my memory though so it might be best for me to steer clear of a rewatch. Thanks! We all have movies that are better in our memory. The Last Boy Scout is another example. Watched that a few years ago, and it just didn't hold up. aw man, you might lose a little respect for me when i tell you that the last boyscout is one of my favorite tony scott flicks. lol. i love that movie! I might be wrong on it. One of the best bits is when Bruce Willis actually kills that guy after threatening him 2 times. Didn't expect that. it definitely has it's moments, and it's tough the way only shane black can write it. to me, it's tony scott's most visually awesome film next to true romance. i think that's what i like about it the most, how visually awesome it is. he just went downhill from there though with all his quick cut editing crap. Love True Romance! That is a classic! Spy Game and Domino had too many quick cuts. I actually enjoyed Domino quite a bit, though I do agree that it overdid on the editing tricks, though it wasn't nearly as bad as the Bourne sequels were in that regard, now the directing in those films gave me a headache! domino drove me nuts!!! and though he's starting to slowly get out of that style and back to his old style like from top gun, true romance and the last boy scout, it's still not quite there yet. i think it was when he did man on fire when all that quick edit shaky cam stuff started. Venom: I agree, Domino has a lot of cool moments, Scott should have toned down the quick cuts. RobotGEEK: Happy he is trying to get out of that style. If Man On Fire didn't have those editing tricks, it would have been a better movie. Also it needed more Mickey Rourke. Arrow Films are re-releasing this as part of thier "Arrowdrome Collection", so going to have give it a look, though can't help but think of the "Mcbain" movies that Renier Wolfcastle used to make in "The Simpsons" and was half expecting to see the same thing here, so not sure to be disapointed or not. Great write-up! Did somebody in this movie shoot down a plane? Or is that something else? There is a hilarious scene in Mega Shark vs Crocasaurus in which a guy "almost sinks" a battleship with a pistol. Elwood Jones: Thanks for following us and the kind words. Wished it was like the Simpsons character also. That would have great. This has some similar bits, but it gets too bogged down in the saving the refugees sub plot. Dr. Blacksteed: Yeah, you're right, McBain and his team do shoot down a plane! About Mega Shark: That sounds like a hilarious scene! Will have to check that out. Funny you should mention the Simpsons, as believe it or not, the producers of this film actually wanted to prevent The Simpsons from using the name "McBain". A compromise was made, where the guy who played McBain in the Simpsons universe was given the name Rainier Wolfcastle, and the name McBain wasn't used in the show again until a few years later. Very interesting! Thanks for the info, Venom! All I can think of is McBain from the Simpsons. Same here! It got a little distracting. You and I are on the same page with this one, had it's moments, could've been better, and disappointing given the cast that it wasn't. And you gotta love Steve James. Good stuff. Can't agree more. Happy were on the same page. This should have been like The Annihilators or Death Wish.